Gardens, Tomatoes, and Salsa: Oh my! 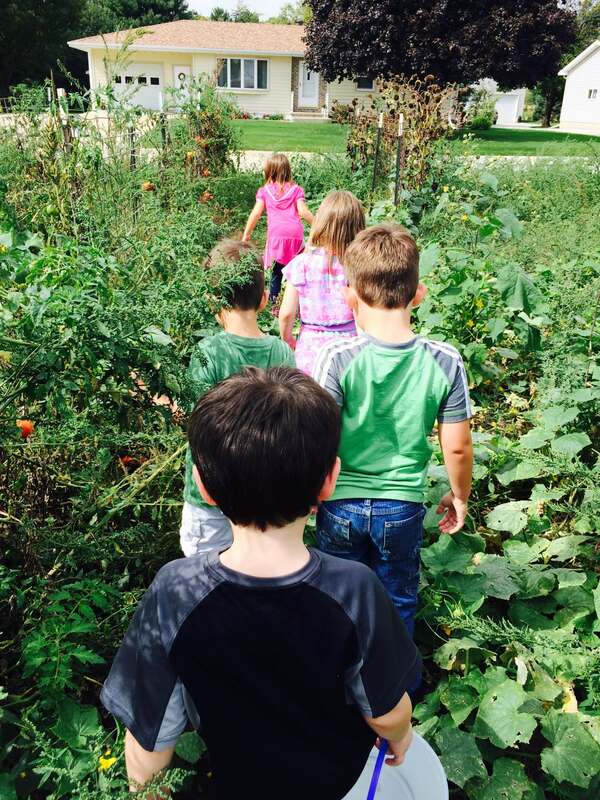 It’s been a busy harvest season at St. Joe’s! Our gardens have been bursting with produce and it’s been great to get out and learn as we harvest yummy veggies! Last week we went out and learned about tomatoes – what the different kinds are – what you can use them for – why they’re different colors – and then we harvested all of the different varieties together – and wow, was it a harvest! 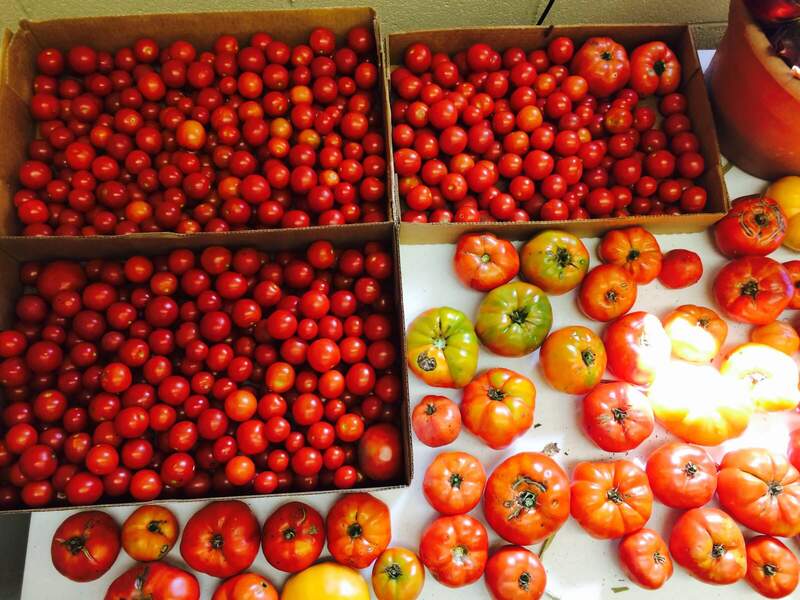 We had a whole table full of all different kinds of tomatoes – it was a beautiful sight. Beautiful rainbow of tomatoes from St. Joe’s garden. The kids had a lot of fun picking them and carrying them back to the school! Eager 1st and 2nd graders in the tomato garden. 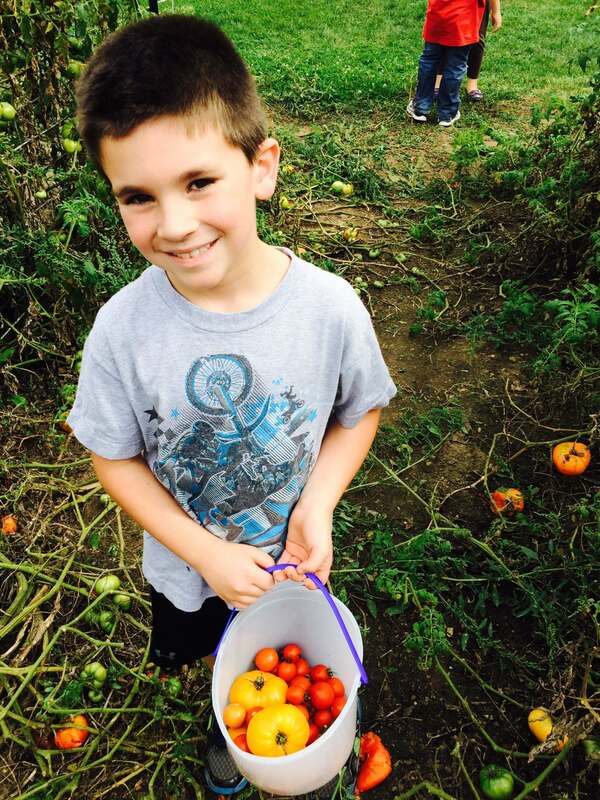 Tomato picking in St. Joe’s garden is a lot of fun! Look at that rainbow bucket! And of course we had to do something with all of those tomatoes! So we made…. SALSA!! Yummy, colorful salsa! These supertasters loved the salsa! Most of the ingredients were all from our own very garden: tomatoes, peppers, and red onions. Different classes came and we learned how to prepare and wash veggies, add spices, and act safely and responsibly in the kitchen. It was a lot of fun! 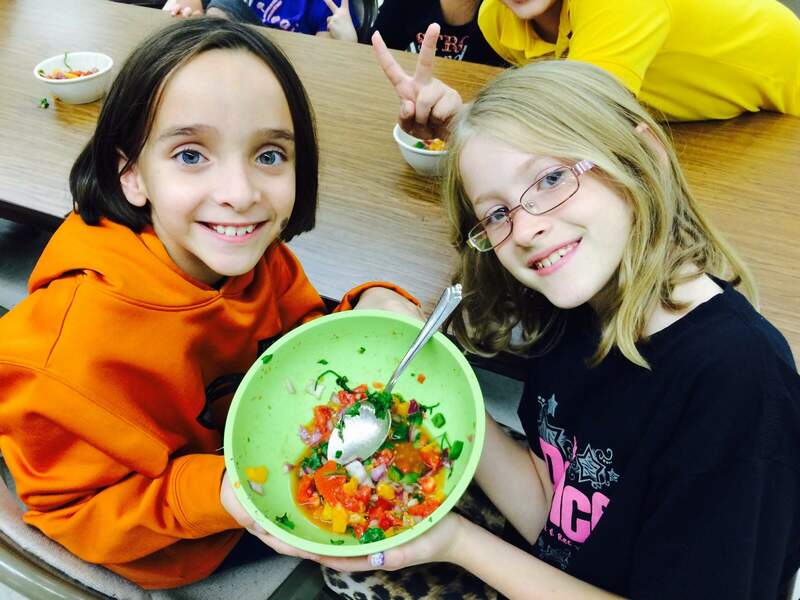 We’re learning how to chop cilantro and stir in spices with our yummy salsa from the St. Joe’s garden! 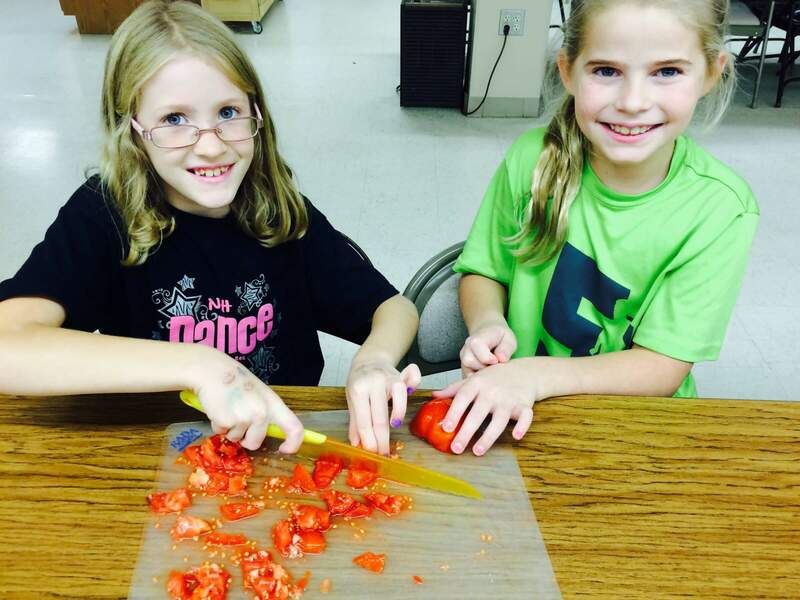 These girls were pro-tomato choppers for our yummy, homemade salsa! Here’s to a great growing year and yummy, healthy food! 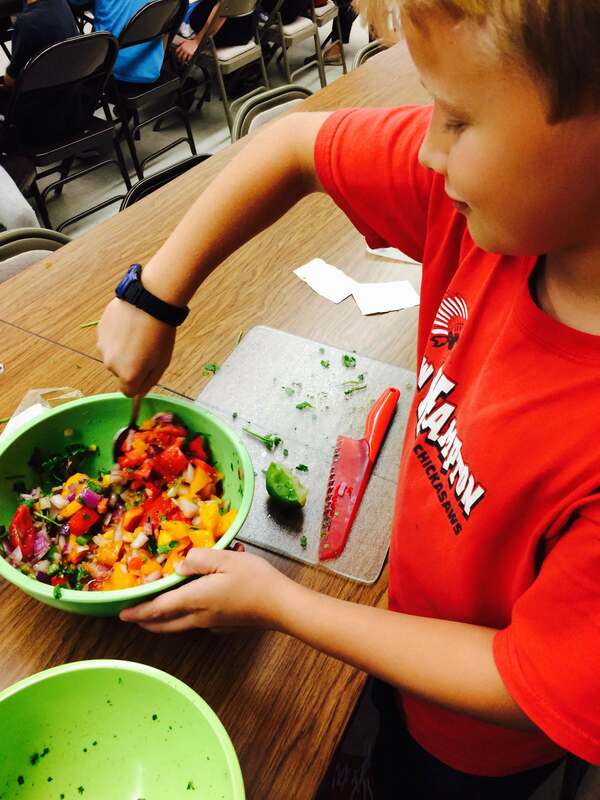 This entry was posted in School Wellness, St. Joseph School and tagged Recipe by Bekah. Bookmark the permalink.